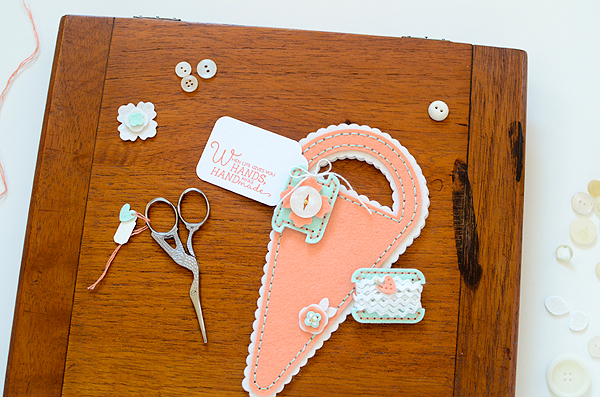 The first Quick Stitch Kit will be released on March 9th, and it is entitled "Sewing Staples". Erin has really outdone herself with this one! 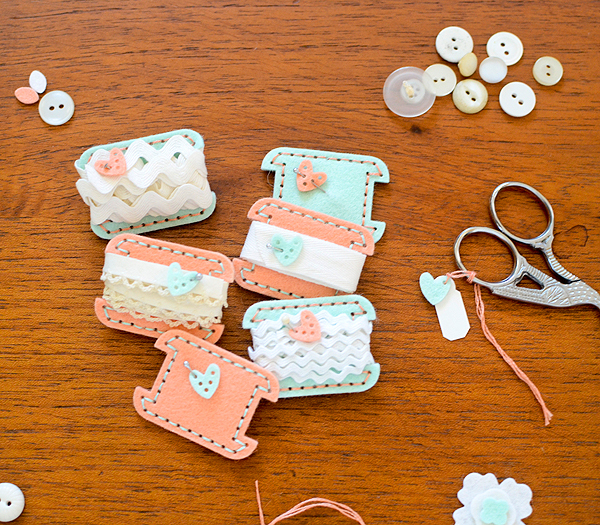 The stitching dies included help you to make a few different sewing accessories that are not only beautiful, but also super functional. 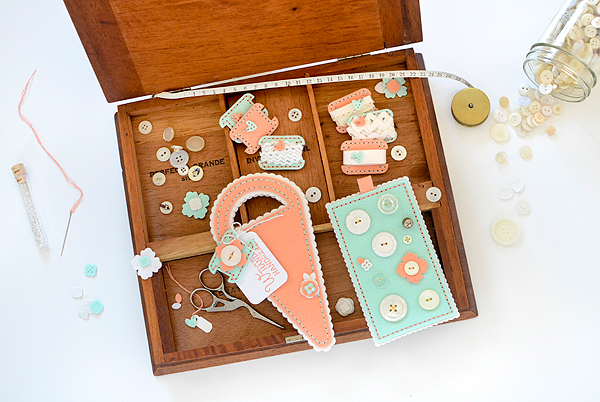 You will have all of your sewing supplies in order just in time for the new stitching products coming out over the next year! 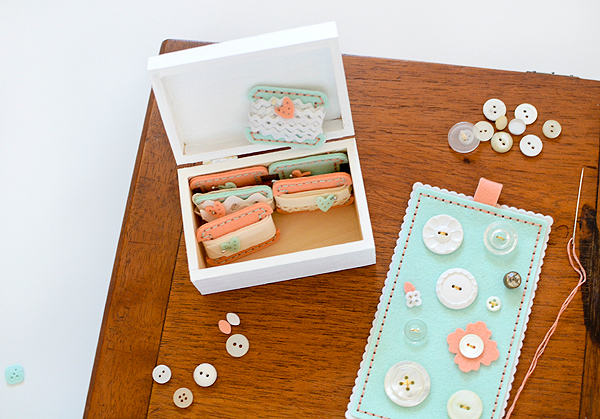 Not only will this kit help YOU to get organized, but also make wonderful handmade gifts for friends and family. The team even has a few unconventional uses for these stitching dies that will allow you to take everything in a completely different direction and get more value for your investment in these tools! 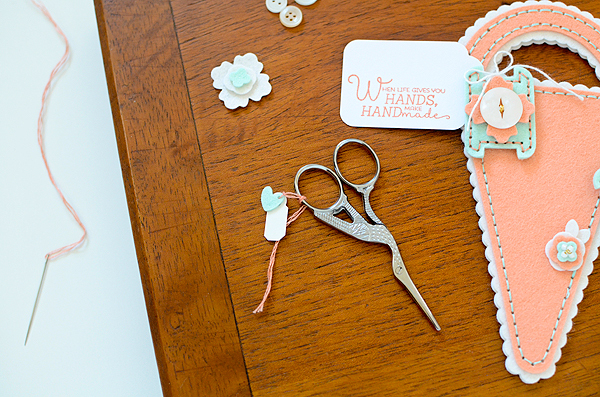 I adore the scalloped scissor keeper and yes, I did actually make one for scissors (coming up next), but I also thought it would be darling as a little flower pouch. 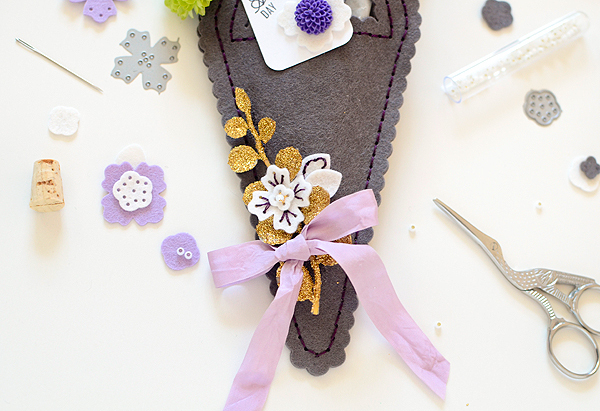 I lined it with wax paper to keep the inside dry and clean and gathered a small bouquet of purple and green flowers to match my Smokey Shadow felt. A few outside decorations--some from the kit, some not--and in no time I had a cute little gift all ready for giving. I'm thinking this would also be perfect for Easter bouquets and wild flowers! Wouldn't it be nice if I passed along a few of the beloved treasures to my aunt? My mom is no longer with me or I would have made her a set, too. I'm not sure my aunt is keen to have loads and loads of these notions but I prepared a few things for her as keepsakes--a handmade, meaningful gift from me to her. 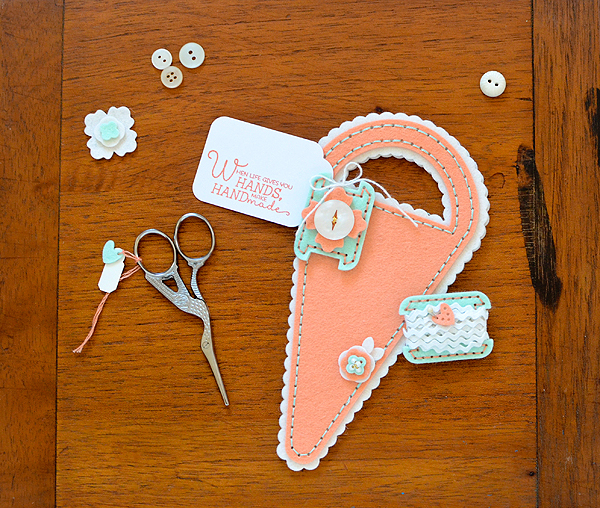 The first thing I made was the scissor pouch in Melon Berry and Vintage Cream felts. 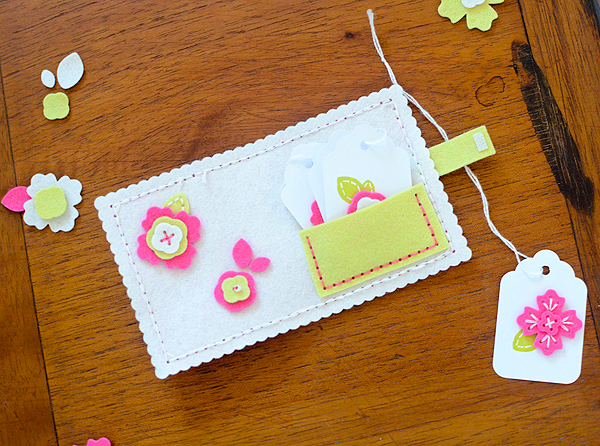 I kept it simple with a single flower and a couple of cute tags--one from paper, using a stamp from the kit, and one made with Aqua Mist felt, using the bobbin die. Years ago, my aunt sewed the tiniest of quilts for my mom. 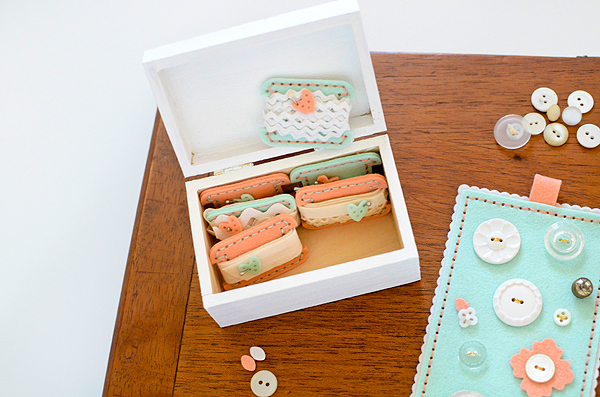 She attached some buttons to a few of the squares and embroidered "My Button Collection" onto it. It has hung in my mother's office since the day it was given to her. 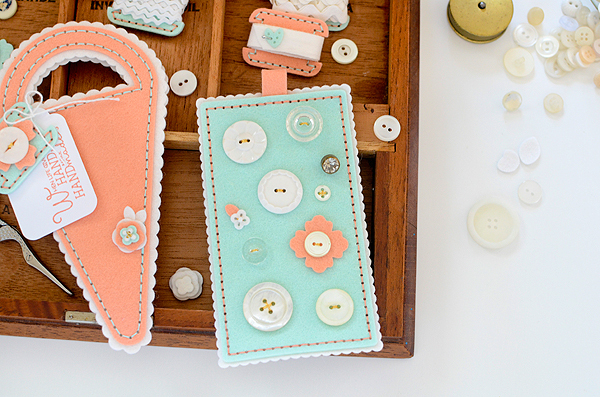 I first thought of filling the kit's wooden box with Grandma Peg's buttons and giving them to my aunt that way, until I remembered that miniature quilt and how I could make something similar from the needle book patterns. I chose some of the prettiest buttons and stitched them to the smaller Aqua Mist felt piece before stitching that piece to the larger white scalloped backing. 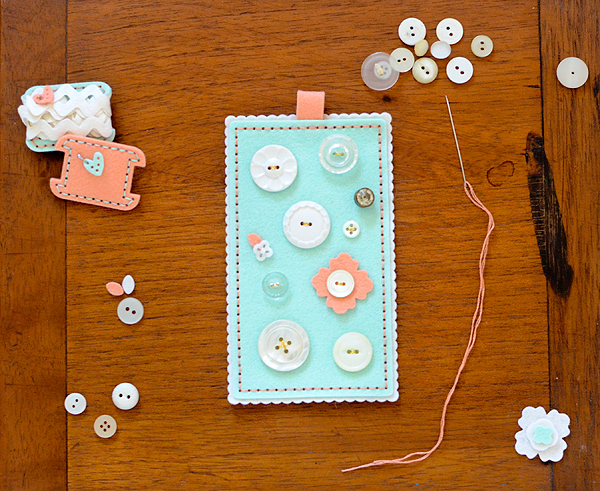 I added a couple of flowers, too, and used the small rectangular die as a tab at the top. (It's part of the Needle Book Die Collection.) I folded it in half and stitched it in place to make a loop. I hope my aunt enjoys her pretty keepsakes! 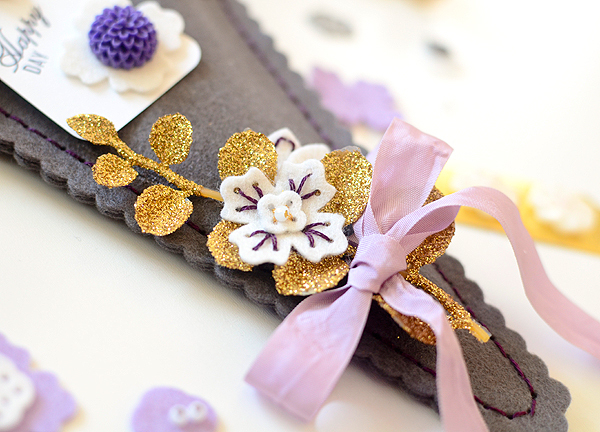 My final project is another needle book that is not a needle book! 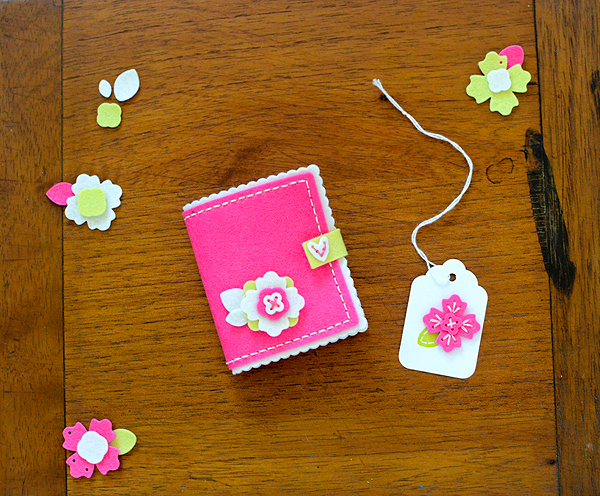 It is closer to a book than the previous one, though--it's folded--and I filled this one with handmade tags. 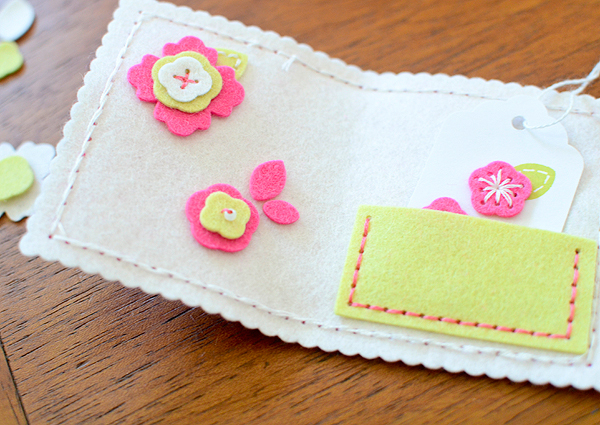 I stitched a pocket to the inside, using Limeade Ice felt, and made 5 flower tags to put in it. The tags are simple and sparse but I'm really pleased with the way they turned out. I stamped leaves (using the stamp set from the kit and Limeade Ice ink), then cut a few different flower shapes out of Raspberry Fizz and Vintage Cream felts. Some I stitched to add interest, while others I left bare. Well...do you think this is something you might want to try? Erin's kit is amazing--she has literally thought of everything whilst designing it, and as I toiled away on my projects this last week and a half, I found myself wondering just what was going on inside that creative brain of hers. 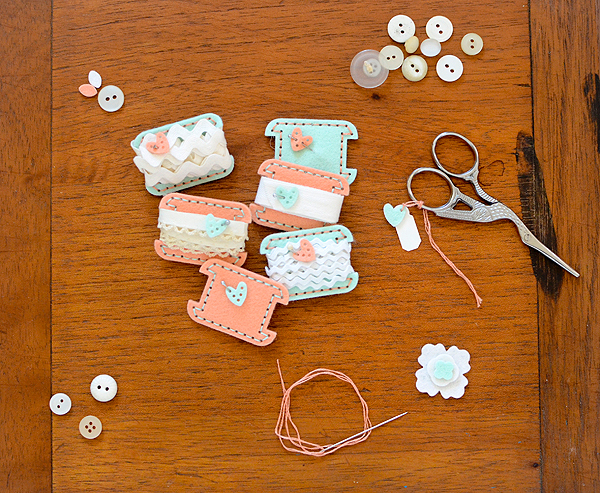 Confession: I really don't know that much about sewing (ssshhh, don't tell)...but that's kind of the genius behind the Quick Stitch Kits: You don't have to! If you can thread a needle, you're basically good to go. Honestly. The rest is just fun! Please be sure to pay a visit to the other ladies on the team--we've all been working hard on these projects and I know their blogs will be full of inspiration for you! And don't forget--the kit will be released on March 9th! 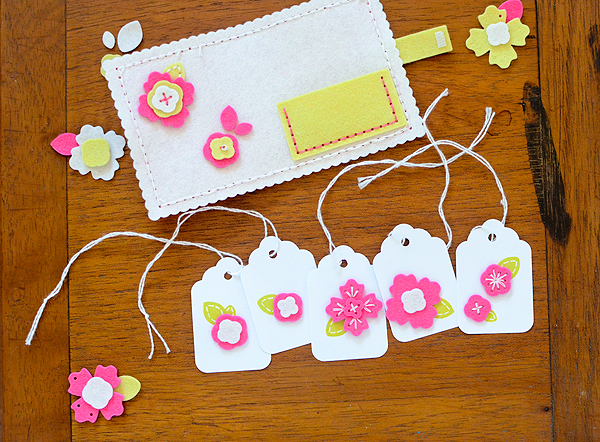 I LOVE your samples and especially love the little booklet filled with tags - what a sweet gift. I am so excited to get my own kit and begin making gifts. 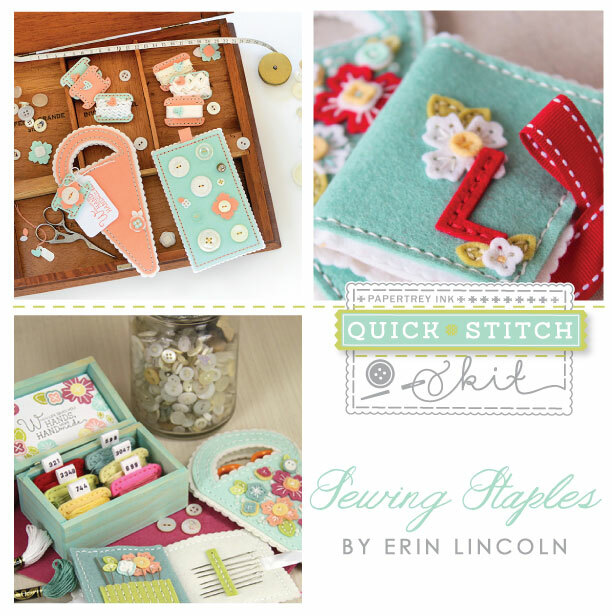 i have several of Erin's other stitching dies and have been able to create many gifts with them. She is a genius at this! 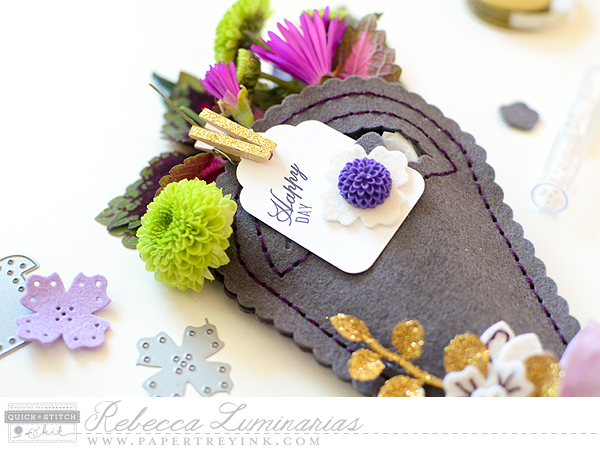 Rebecca, I love all your samples and the tag booklet is something I can't wait to create. Your color combinations are awesome too. I was in love with this set when I saw Erin's idea, but now as I go through all of the design teams post I love it even more!! What great ideas you have! The tag book is a great idea! Thanks for sharing all your ideas! Holy cow! You went to TOWN! This is all so beautiful, and through your whole post I kept falling in love with your colour combos. You clearly had fun with your kit! Great job! Wow! I love your projects!!!!! I really like your choice of colours and the imaginative way you used the kit! 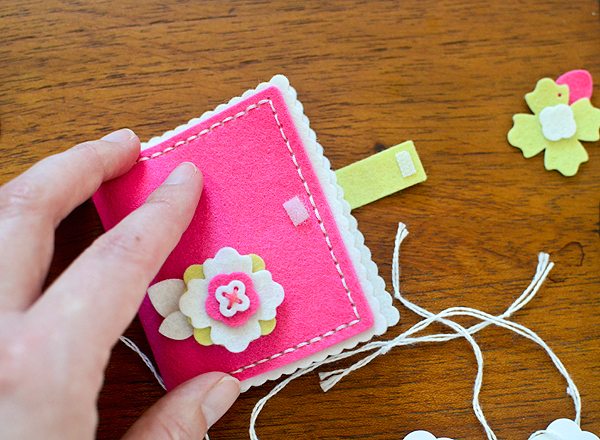 All your projects are great, but the tag book is really sweet! And I love how you did the little angle stitch in the corners on the inside. Your post is filled with great and different ideas and I love each and every one. 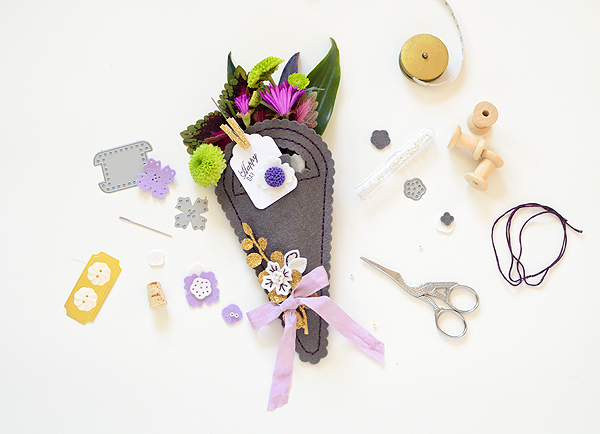 My favorite is the scissor holder filled with flowers. I will have to make one for my kitchen fridge as a magnet. It will cheer the room up a lot. Every photo showed another great idea and I loved them all. Loved every one of your creations, but the small tags melted my heart!!! These are the most gorgeous creations I have seen in a long, long time, totally adorable and I want them NOW!! You are extremely talented Rebecca. Lovely! Where do you get your felt?